Frameless glass shower doors add a signature touch to your bathroom with stainless steel attributes and clear toughened glass, which beautifully displays your shower tile walls. Not to mention, the clear glass doors invoke a sense of showering in nature. 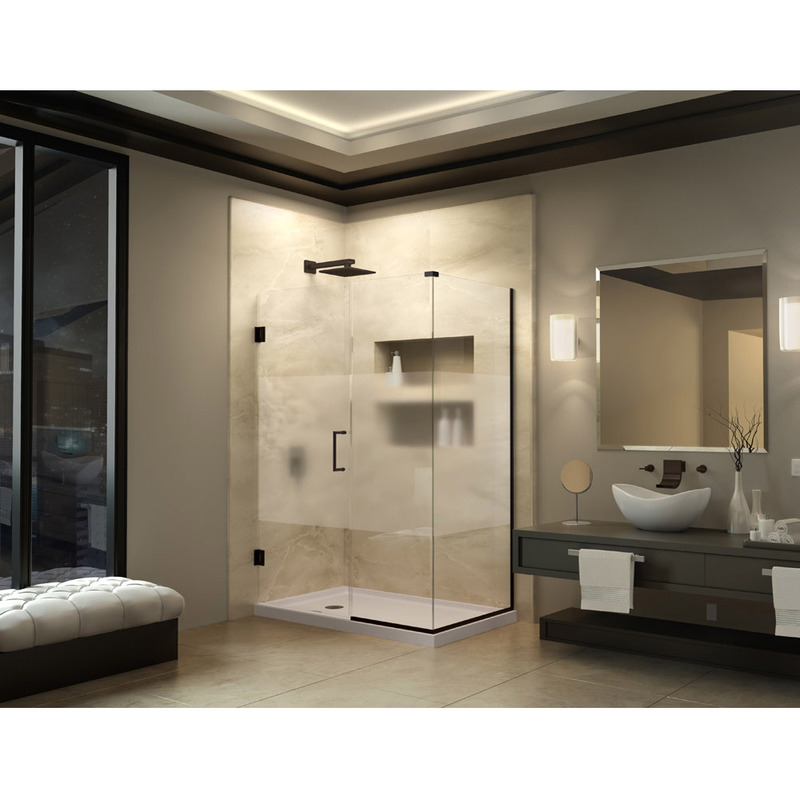 There are a variety of glass shower door designs to suit just about any taste and bathroom style, and many come with the choice of right or left door opening for your convenience. Read on to find the perfect glass shower doors for you. If a sense of luxury is what you prefer, then you are sure to find it in our Enigma X shower doors, which feature a completely frameless glass complete with a 3/8″ dense ANSI certified toughened glass door with glossy or brushed stainless steel parts and a top bar for storing towels, which is just perfect for an at-home spa day. 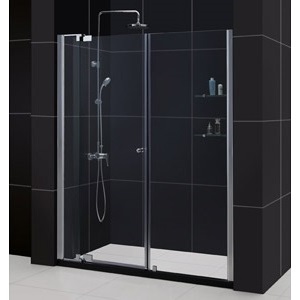 The glass doors feature DreamLine Exclusive Clear Glass protective anti-limescale coating for added comfort and easy gliding on a stainless steel track. 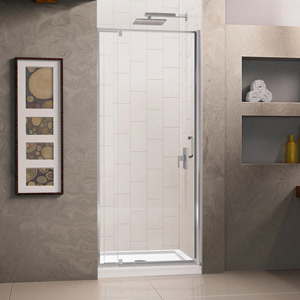 The Enigma X shower doors can be installed against finished walls and are reversible for left or right door opening. 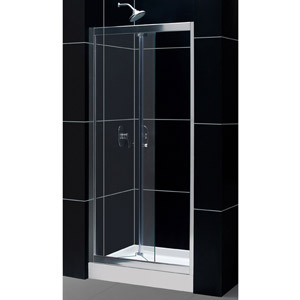 It includes an anti splash strip to prevent leakage, SlimLine shower base, and more. The Unidoor Privacy glass bathroom doors for showers, brilliantly blends elegance with privacy for a more modest approach. This door features a 3/8″ dense toughened frameless glass door, with a frosted band across the middle for a bit of mystery while you shower. It includes chrome, brushed, nickel or oil rubbed hardware, brass wall mount self-closing hinges and right or left door open installation, and more. 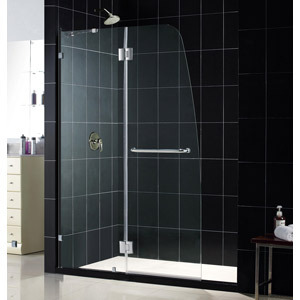 Our Butterfly shower door features a unique clear glass bi-fold door, which is sure to impress. These doors feature a 6 mm clear, dense toughened bi-folding glass, a chrome hardware kit and andonized aluminum side rails and profiles, for a bit of fun. These doors can be installed against finish walls and offer left or right door opening for convenience. Looking to add a little charisma to your bathroom? 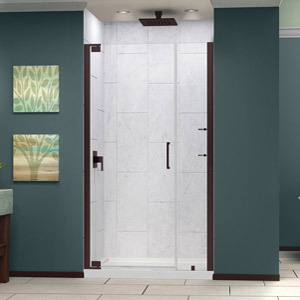 Then check out the Charisma, and rightfully named, shower doors for walk in showers. These doors promote an air of brightness with 2 clear panel frameless by pass (sliding) doors to welcome in an abundance of light. They include a chrome or brushed nickel hardware kit, convenient towel bars and a no-wall profile design for a completely frameless look, and more. 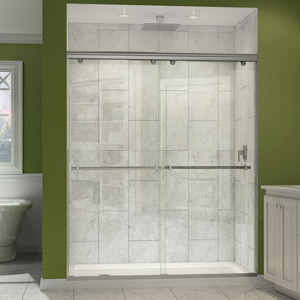 Still unsure about glass shower doors? 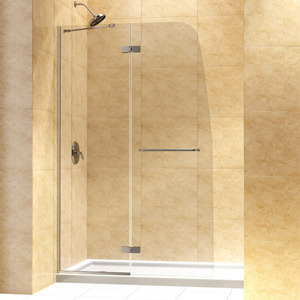 Take a look at our Mirage glass shower doors, which are just as unique as they are lovely. 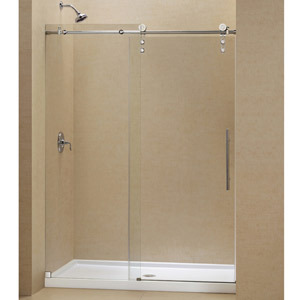 These completely frameless doors feature 3/8″ dense clear toughened glass and brushed nickel or chrome hardware parts. They offer a unique operating system with one sliding panel and one stationary panel. 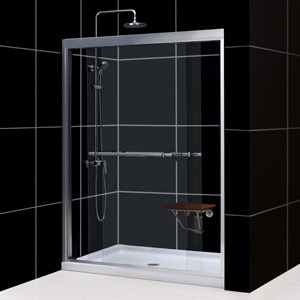 Mirage glass shower doors come complete with an aluminum bottom guide rail, optional SlimLine shower base, and more. This is but a taste of what’s in store for you when you visit our gallery. We supply affordable, quality glass shower doors for a number of individuals, including designers, contractors, home owners, retailers and architects, and all shower doors come complete with a limited 5 year manufacturer warranty. For more information about our products, please contact our staff at 718-433-0060 today!